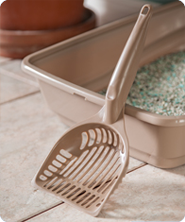 Tidy up your cat's litter box with the Cat Litter Scoop to make it fresh and clean again. It features a comfort grip handle and sturdy design making regular cleaning easy. The slits in the scoop can sift out clumping litter and leave the dry litter in place. Its sleek appearance allows for easy storing for wherever you keep your pet supplies and its polished finish is easy to clean. This litter scoop is the ideal for owners of small to large sized cat pans. This litter scoop can also be paired with either the Framed Cat Litter Pan or the Large Cat Litter Pan. The overall dimensions of this item are 10 3/4" L x 5" W x 2 7/8" H.
Overall Assembled Size: 10 3/4" x 5" x 2 7/8"
Cat Litter Scoop is rated 2.6 out of 5 by 5. Rated 1 out of 5 by Cliff from Bought one a few years back and it worked great. I had to purchase a new one after the old one broke. I've bought four this week that broke. Do not buy this product. Go somewhere else for your plastic needs. Rated 1 out of 5 by hjs from Buy another company's product Have used a previous version of the scoop and was quite pleased with it. It eventually broke but I had purchased a couple of the scoops as backup. The backup turned out to have a narrower handle. The scoop was flimsy compared to the scoop that just broke. Now I have two scoops which I will be replacing with another vendor's product. Rated 5 out of 5 by momby from Best scooper I had had cats for over 20 years, and this is the best scooper. Most only last a short while as they crack. Have had this one for over a year, and it is as good as the day i bought it, Would definately buy again. Rated 5 out of 5 by Anonymous from Best scoop I bet you don't get a ton of reviews in the scoop. I love it. It's sleek and it stores nicely. The color is ok, a grey would be nicer but its the best show in town. Rated 1 out of 5 by jeff g. from poor stability The litter scoop I purchased does not have any duribility if you try to dig into the litter at all!